Home / Posts Tagged "UVFTS"
Join Upper Valley Farm to School and Vermont FEED for a Level I Professional Learning Course: Cultivating Farm to School. This learning opportunity is designed for school educators, staff, administrators, and community members to explore and expand their personal and professional knowledge and experience related to Farm to School education while building and strengthening school community connections. Participants will be encouraged to build and develop shared learning experiences for their students while building and developing the vital relationships necessary to make Farm to School education a real and lasting part of their community, classroom and cafeteria. Interactive class sessions will include a balance of hands-on cooking, individual work time, networking, guest presentations, dialogue, small group activities and practical experiences that will serve to deepen participant understanding of the various elements and promising practices of farm-to-school programs. We are very fortunate to be able to provide free tuition to all New Hampshire participants. 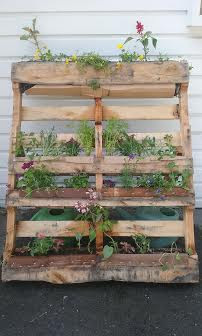 New Hampshire participants will also be eligible to apply for a mini-grant to support a farm to school project in their school. Funding for this opportunity is from the Wellborn Ecology Fund of the New Hampshire Charitable Foundation. 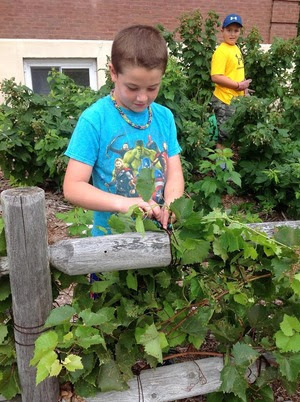 Newbury Elementary School: “The Newbury Elementary School has be en enjoying the fruits of many labors with the success of our first “Grow-a-Row” program. Throughout the summer, green-thumbed and generous community members tended an extra row or two in their gardens and then sent along the harvest to Chef Paul, our energetic food service director. Instead of piling up produce in the kitchen and walking away, these same folks and others met on certain days to help Paul process and freeze the offerings so that they could be used throughout the school year in our lunch program. It’s such a win-win and the program continues to gain interest and develop. We enjoy wonderful community support here. 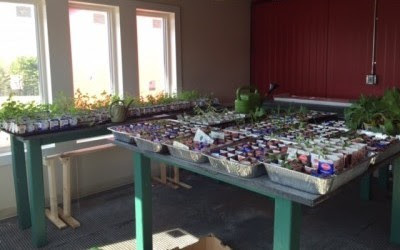 We’ve added two new components to our program that helps support the Grow-a-Row program and our commitment to eating more locally: we purchased a large, walk-in freezer and a small greenhouse. The freezer has already been pressed into action holding the processed vegetables we acquired over the summer. The beautiful new greenhouse will be utilized by the students and teachers as we continue to learn together about gardening and botany. We held our first of the year staff meeting about our Farm to School program. Staff members learned about our plan for the next five years, the resources available to them, and in the process, made a really delicious “massaged kale salad” to enjoy during the meeting. The Farm to School team did a great job informing the rest of the staff about easy ways to build in farm to school lessons and values into the curriculum through project based learning. Students helped “put the gardens to bed”… all except one: our 5/6 team planted a bed of garlic to be used in the kitchen next year. It is now sleeping under this first snow of the year! October is National Farm to School Month, a time to celebrate connections happening all over the country between schools and local food! Farm to school enriches the connection communities have with fresh, healthy food and local food producers by changing food purchasing and education practices at schools and early care and education settings. Students gain access to healthy, local foods as well as education opportunities such as school gardens, cooking lessons and farm field trips. The 2016 National Farm to School Month theme, One Small Step, will highlight the simple ways anyone can get informed, get involved and take action to advance farm to school in their own communities and across the country. Join the celebrations by signing the One Small Step pledge and take one small step to support healthy kids, thriving farmers and vibrant communities this October. Whether you are a food service professional, a farmer, a teacher or a food-loving family, there are plenty of ways to celebrate and get involved in National Farm to School Month! The National Farm to School Network offers a variety of free resources on its website, farmtoschool.org, including posters, stickers and a communications toolkit. 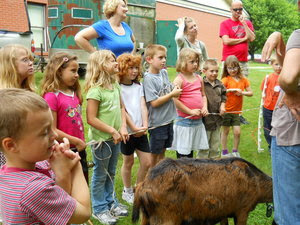 ​ Sharon Farm and Field Day a Success! Sharon ​ Farm and Field Day a Success! On Thursday, May 26th, we enjoyed our annual Farm and Field Day! Children rotated through a variety of stations. Stations included: ducks, sheep, circle art, work songs, planting in the production garden, building container gardens, and two games. It was a busy day, but super fun! Garden Expansion at the Newton School! Trek to Taste, an annual celebration of trails, local food, and healthy living will be hosted at Marsh-Billings-Rockefeller National Park and Billings Town Park. The Upper Valley Farm to School Network will be hosting a farm to school showcase that will be highlighting farm to school projects from around the region. Learn about school-based hydroponics, cooking over an open fire, and other hands-on farm to school projects. You can also enjoy guided walks, family games, arts and crafts, demonstrations, an ice cream social, music and more. www.trektotaste.info.